Southern Utah University Athletics Director Ken Beazer has announced the hiring of Tom Gray as head coach of Thunderbird softball. Gray will become the 10th head coach of the softball program and inherits a team that qualified for the NCAA Regionals in 2014. "Coach Gray has a great deal of coaching experience at a high level," Beazer said. "He has strong regional recruiting ties, and we are happy to have he and his family join the Thunderbirds. They will be a great asset to the community, and we look for him to continue to build upon the success that our softball team has enjoyed." Gray most recently appeared on the coaching staff at Oklahoma State, serving as an assistant coach from 2009-2014. 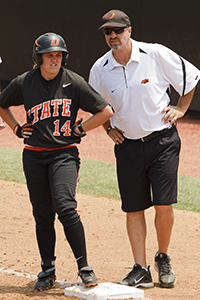 In Stillwater, Gray helped the Cowgirls to three NCAA tournament appearances, including a spot in the 2011 Women's College World Series. Prior to his arrival at OSU, Gray was co-head coach for seven seasons at Illinois-Chicago, compiling an overall record of 216-208 with Sarah O'Malley-Fisher. The duo guided the Flames to three 40-win seasons, four Horizon League regular season championships and a pair of NCAA Regional appearances. Gray began his coaching career at Crossroads High School in Santa Monica, Calif. where he led his team to nine consecutive league championships from 1990-98. During that time, he was named the California Interscholastic Federation Coach of the Year three times, earning the honor in 1992, 1993 and 1996. In addition to his softball duties, Gray was a physical education teacher for 10 years and also served as the assistant athletics director at CHS from 1992-93. During his time at Crossroads, Gray also served as an assistant coach for the Orange County Batbusters, an ASA U-18 gold team. The team was recognized as one of the top teams in the nation, capturing the Gold National Championship in 1997 and finished as a runner-up in 1998. "I can't wait to get going. This is a fantastic opportunity for myself and my family," Gray said. "I'm looking forward to working with a supportive community, a supportive administration and with girls who are ready to excel."